Chemists from the University of Michigan (U-M) have developed new materials made of rigid plastics that are at the same time lightweight, robust, economical and able to store hydrogen fuel, opening a new step towards an hydrogen-based economy. You've probably read that an hydrogen-based economy will emerge soon -- or in twenty years. But first, we need to find efficient ways to store hydrogen fuel. Now, chemists from the University of Michigan (U-M) have developed new materials made of rigid plastics that are at the same time lightweight, robust and economical. These new materials, called covalent organic frameworks (COFs), are made of light elements, such as hydrogen, boron, carbon, nitrogen and oxygen, and can be assembled to form predictable crystal structures -- something that never had been done with rigid plastics. So far, these materials are only available in labs. Before entering technical details, it's interesting to discover why a young scientist wants to enter a specific research field. Omar Yaghi is a professor of chemistry at U-M involved in this COFs work. Here is a link to a recent interview with him where he tells us about his motivations. It was the aesthetic aspects of chemistry, rather than the utilitarian, that first lured him into the field, the 40-year-old professor recalls. But his urge to understand the molecules he found so attractive eventually led him to develop materials with very practical applications: storage of hydrogen, methane and other economically and environmentally important gases. "I didn't set out to solve any big problems," Yaghi admits. "I was drawn to chemistry mostly because of the beauty of the molecules." Browsing through a college catalog one day, he came across pictures of cage-like chemical structures similar to buckyballs. Yaghi "fell in love" with the structures and decided on the spot that he wanted to learn how to design and make chemical structures of various shapes. Now, it's time to listen to Adrien Côté, who is a member of Yaghi's laboratory, to discover what these researchers have created. "Normally, rigid plastics are synthesized by rapid reactions that randomly cross-link polymers," said postdoctoral fellow Adrien Côté. "Just as in anything you might do, if you do it really fast, it can get disorganized." For that reason, the exact internal structures of such materials are poorly understood, making it difficult to predict their properties. But Côté and colleagues tweaked reaction conditions to slow down the process, allowing the materials to crystallize in an organized fashion instead of assembling helter skelter. Below is a picture showing the crystalline sheets produced in covalent organic frameworks (COFs) (Credit: Adrien Côté, U-M). And here is a link to a larger version ( 3,400 x 4,400 pixels, 1.45 MB). And below is a scanning electron microscopy (SEM) image of "a COF-5 revealing the piles of deformed hexagonal plates" (Credit: U-M). 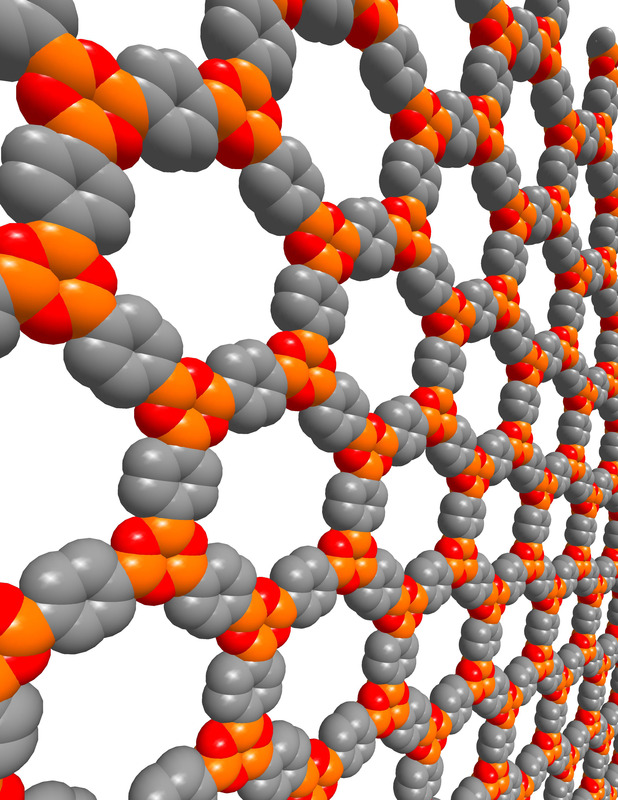 And for more information, this research work has been published by Science under the title "Porous, Crystalline, Covalent Organic Frameworks" (Vol. 310. no. 5751, pp. 1166 - 1170, November 18, 2005). Here are two links to the abstract and to some supporting online material (PDF format, 49 pages, 1.57 MB) for this article.